Ben and James discuss Disney’s recent announcements on streaming and what it says about not just TV but strategy broadly in the Internet era. Ben and James discuss Senator Warren’s proposal to break up Big Tech, including why its history is wrong, why details matter, and what needs to be done instead. Plus, Spotify’s antitrust complaint against Apple. Ben and James discuss Mark Zuckerberg’s latest missive, whether Facebook is actually changing anything, and wonder if the company will ever tell the unvarnished truth. Ben and James discuss Amazon, Walmart, and groceries, Google Cloud versus AWS, and why understanding value chains helps evaluate business opportunities. Ben and James discuss Apple News as it is today, where Apple wants to take it in the future, and why publishers should push back. Ben and James discuss Apple vs Facebook (and Google!). Ben and James discuss open source in a cloud world, how enterprise value chains have changed, and AWS versus Microsoft. Ben and James discuss Apple’s revenue warning and the company’s shift to services. James and Ben talk about the connection between Jobs to be Done and Aggregation Theory, why the consumer and enterprise markets are so different, and discomfort with big companies like Google. Exponent is taking a break, for now anyways. We couldn’t be more grateful for everyone that has given us so much of their time. Ben and James discuss Microsoft’s acquisition of GitHub. Ben and James continue to discuss the differences between platforms and aggregators, including Facebook, Microsoft, Apple, Google, Netflix, Amazon, and Uber. Ben and James discuss the differences between Facebook, Google, Microsoft and Apple specifically, and the differences between aggregators and platforms generally. Ben and James discuss how Apple and Amazon’s focus on the customer experience protects them from low-end disruption. Ben and James discuss Zillow’s shift in business model and the further refinement of Aggregation Theory through the incorporation of the ideas of disruption. Ben and James discuss President Trump’s intervention in Broadcom’s takeover of Qualcomm, the problem with patents, and whether or not markets inherently overvalue short-term thinking. Ben and James discuss Spotify’s F-1, why Spotify isn’t Netflix, and why record companies are doing well even though they are acting sub-optimally. Ben and James discuss Dropbox’s S-1 and why the company is a success but still a disappointment. Plus, why companies should go public sooner. Ben and James discuss Google’s recent moves around blocking ads and promoting AMP and whether they raise antitrust questions. Plus, why Microsoft couldn’t have stopped Google, and why cryptocurrencies are aggregator kryptonite. NOTE: The previous version of this episode was not edited in the middle. There is no new content in this episode, but it should be easier to listen to. Ben and James answer reader questions. Topics include business school, career advice, the nature of strategy, creating the next Silicon Valley, and how governments should deal with the disruptions caused by the Internet. Ben and James discuss Apple’s strategy of monetizing its customer base, how that explains HomePod, and whether or not it is a problem. Ben and James discuss Amazon’s health care announcement and why the industry is so challenging. Ben and James discuss Amazon Go and what it says about the economics of tech and how Amazon is building multiple monopolies. Ben and James discuss the Meltdown and Spectre bugs and what they say about processors, technology, and even society. Ben and James discuss Disney’s recent history, its acquisition of Fox, Netflix’s power, and why more and more policy decisions are about choosing the worst of two options. Note: This episode was recorded on Monday, December 18, 2017. Ben and James discuss why effective content moderation is so hard, how it can be done, and why it sometimes shouldn’t be. Plus, how tech optimists and tech critics make the exact same mistake. Ben and James discuss the net neutrality debate and why both sides of the issue at hand involve making difficult tradeoffs; the bigger problem is broken governance. Please listen to the end! Ben and James discuss IPOs, including those of Stitch Fix, SendGrid, and Blue Apron, and the importance of understanding what type of company you are. Ben and James break down the differences between new market and low end disruption and how they apply — or don’t — to Apple and the iPhone. Ben and James walk through the history of Stratechery to explain why Facebook is inescapable for a podcast about tech and society. Ben and James discuss why acquisitions should be the focus of tech regulators in the context of Facebook buying tbh today, and Instagram and WhatsApp previously. Ben and James discuss the structure that leads to gatekeepers and abusers like Harvey Weinstein, and why it is so dangerous to accept as fact that the world was better before the Internet. Ben and James discuss the development of theory, why blogs have disrupted books, and why too many in tech are too pessimistic about humanity. Ben and James discuss the different levels of aggregation, Facebook and Russian ads, and why it’s worth defending the future. Ben and James discuss Apple’s the cellular Apple Watch, the iPhone X and 8 markets, and whether the opening was over-the-top. Ben and James discuss the why it is Ben can’t stop talking about Aggregation Theory, and the future of regulation. Ben and James discuss the Theory of the Conservation of Attractive Profits, Intel, Netflix, and how it all applies to Disney. Ben and James discuss Benchmark’s lawsuit against Uber and Cloudfare’s ban of Daily Stormer. Ben and James discuss the European Commission’s antitrust ruling against Google and the challenges of antitrust in a world governed by Aggregation Theory. Ben and James discuss Amazon’s acquisition of Whole Foods, when acquisitions make sense, and the potential future of antitrust law. Ben and James discuss the business of podcasting specifically and advertising generally, and why Apple’s recent changes will have less of an effect than people think. Ben and James discuss Apple’s WWDC keynote, playing to your strengths, and privacy that matters. Ben and James discuss myths, culture, and blockchains — and yes, bubbles. NOTE: The original version had a corrupted file. Our apologies. Ben and James discuss why figuring out a new model means abandoning the old, this time in the context of newspapers and news. Ben and James discuss how leverage shifts in a value chain, why WeChat is so powerful in China, and why that is a problem for Apple. Ben and James discuss what it means if Facebook is a monopoly, what is lost if it is, and why there isn’t anything that can be done about it — for now. James and Ben discuss moral hazard and what seems to be going wrong with the U.S. economy, the different kinds of regulation, and how the App Store explains government policy. Ben and James discuss Apple’s Mac Pro screw-up and what it might say about the company and its culture. Ben and James discuss the meaning of artificial intelligence, whether machine learning qualifies, and a platform for dealing with the impact. Ben and James discuss Uber’s recent scandals, and debate whether the company’s business actions can be separated from its culture. Ben and James discuss Mark Zuckerberg’s manifesto, the problem with regulation, and why Facebook needs exactly that. Ben and James compare Snap and Facebook to Apple and Microsoft, and worry that Snap’s business is misaligned. Ben and James discuss what kind of politicians and products cut through in the Internet age, and why they are profoundly different than what worked before. Ben and James discuss the history of messaging apps, the rise of Snapchat, and why Instagram Stories was such a brilliant move. NOTE: The original audio file had a problem at the 36:50 mark; if you encounter this, please delete the file from your podcast app and re-download. Ben and James celebrate two milestones: 10 years for the iPhone, and 100 episodes for Exponent. This is a good one: it in many respects summarizes the entire run of both Exponent and Stratechery. Ben and James discuss cloud computing and why Google fell behind AWS, and how the company is taking a very wise strategy in catching up. Note: Due to a recording error Ben’s track quality is poor. Our apologies. Ben and James discuss the fake news epidemic on Facebook, from its structural causes to its effects. Then, Facebook committed sins of omission; the tech industry ought not do the same. Ben and James discuss the Trump election, filter bubbles, and the responsibility of the tech industry. Ben and James discuss the difference between the IT era and the Internet Revolution, first in the context of newspapers and then in the context of society broadly. Ben and James discuss what Consumerization of IT means in the context of Workplace by Facebook, Skype Teams, and Slack. Note: This podcast originally had a dead spot at the 8:13 mark. It has been fixed. To update please delete the podcast and re-download. Ben and James discuss the history of Android and why Google’s new phone signifies such a profound shift for the company. Ben and James follow-up on Facebook versus the media, and then dive into Spectacles and what makes for a compelling product. Ben and James discuss Oracle’s prospects in the crowd and how the Internet has changed the enterprise. Ben and James discuss Facebook’s latest run-in with the media: both are wrong but for different reasons. Ben and James discuss James’ adventurous summer and the recent Apple event and what it says about the future of Apple. Ben and James discuss Facebook Live and Pokémon Go. Please note that this episode was podcast five days ago, on Saturday, July 16. Ben and James discuss why the sociopolitical factors underlying the Brexit vote and their relationship to technology and a system of the future. Ben and James discuss how the TV industry and the companies that advertise on TV are interconnected, and how they will rise and fall together. Ben and James discuss Microsoft’s acquisition of LinkedIn and Apple’s WWDC announcements, and figure out why they feel so differently about the two of them. Ben and James discuss briefly revisit last week’s discussion on Facebook, then discuss the Peter Thiel versus Gawker affair, and the implications for tech broadly. Then, how culture helps and hurts at Facebook, Apple, Google, and Microsoft. Ben and James discuss the allegations that Facebook is censoring conservative news, and renew their ongoing debate about Facebook’s power. Then, why Google’s current situation is similar to Microsoft, even though the long-term looks good. Ben and James follow-up on last week’s Apple services discussion and take a look at Apple’s earnings. Then a discussion of the European Commissions investigation of Google for antitrust, and a debate about how antitrust regulation needs to change, if at all. Ben and James discuss the different types of organizational structures, the benefits Apple gains from having a unitary form, and whether or not the company should make changes to more effectively compete in services. Ben and James discuss Facebook F8, how the company is trying to own both public and private social, and why Messenger is a good idea, but bots may not be. Ben and James discuss the Tesla phenomena, how they built such a powerful brand, and debate whether that will be enough to lead the company to success. Ben and James discuss how Snapchat has built it’s product so effectively, the narcissist in all of us, and the structure of social around the world. Ben and James continue last week’s discussion about Apple’s struggles with the cloud, then discuss why the iPhone SE is such a brilliant move — and how those two things are related. Plus, an after-show about Microsoft and Intel and what makes for an effective leader. Ben and James discuss the connection between Amazon’s business model and organizational structure, why Dropbox shouldn’t have left AWS, and why Apple should buy Dropbox. Plus, does WeWork’s valuation make sense, and why such companies are exciting. James’ sister’s startup (referenced at 1:06) is Adorne Monde. Ben and James discuss the Amazon Echo, Apple’s cloudy future, Google’s Missed Opportunity, and why Amazon has so much growth potential ahead of it. Ben and James discuss Apple versus the FBI. Ben and James discuss the mistakes made by Zenefits, when to challenge regulation, and the problem with short-term thinking. This podcast was recorded before the Apple/FBI news broke; we currently plan to cover that next week. Ben and James discuss winner-take-all dynamics and its implications for advertising, bubble talk, and venture capital. Plus, what Facebook and Marc Andreessen got wrong about Free Basics and India. Ben and James discuss Apple earnings, Twitter’s troubles, and whether or not the Internet is over-rated. This episode is sponsored by Wealthfront. See recommended portfolios and get up to $15,000 managed for free by visiting Wealthfront.com/exponent. Ben and James discuss the Donald Trump and inequality, then FANG, Aggregation Theory, and Disruption. Ben and James discuss the future of cars and transportation. Ben and James discuss Paul Graham’s essay on inequality and the politics of technology. Ben and James discuss OpenAI’s new mission and what it says about capitalism. Or is it just a strategy credit that we are reading too much into? 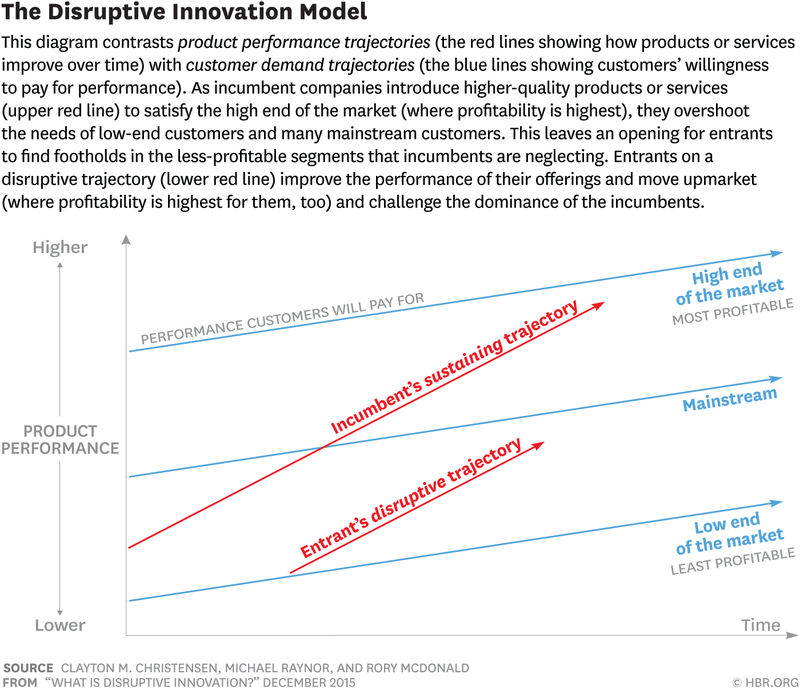 Ben and James discuss when disruption theory is useful — and when it isn’t. Note: We apologize for some mic fuzz issues on this podcast. Ben and James discuss PC Gaming and the fascinating way in which it monetizes, leading to a wide-ranging discussion about how business has changed because of the Internet. Ben and James touch on Twitter’s new “Like” button before diving into what might be a new model for publishing. Then, a discussion of bundle economics and Stratechery’s future. Buckle up! Ben and James try to make sense of YouTube Red. Plus, why is Amazon responding to The New York Times now? Ben and James discuss how cloud services have set the stage for fundamental changes in venture capital, just as they have in the enterprise. NOTE: James’ mic developed a bad connection half-way through the podcast. We apologize for the audio fuzz. Ben and James make clear that they know pollution causes death, then discuss the future of brand advertising. Then, a rather strident debate as to whether radical ideas will have a home in the future. This episode is sponsored by Zendesk. Make your customer service seem like magic by building it directly into your apps, websites and products with Zendesk Embeddables. We start with Volkswagen, then mortgages, then Ben’s time in Taiwan, and finally end with a critique of the Apple Watch. It all makes sense in the end. Hopefully. Ben and James briefly discuss ad-blockers, then admit it’s an academic debate and move on to the business of advertising and the far more profound shifts that are caused on the Internet and by new places on the Internet. Note: This podcast references Marco Arment’s Peace application, but was recorded before Marco pulled the app. Please see the relevant links below. Ben and James discuss James’ sophomore experience at Burning Man, and then turn to the iPad Pro and its paucity of quality of applications. Just how much is Apple responsible? Ben and James discuss the New York Times exposé on Amazon’s work practices at its Seattle headquarters. What exactly was the story about, what questions are raised by it, and more importantly, what are the right answers for not just Amazon but society as a whole? Ben and James discuss the decision by the California Labor Commission that at least one Uber driver is an employee: will this affect the company’s valuation? More broadly, is this a good or a bad thing for society, and why is it that people blame Uber for societal shortcomings? Then, more on the alleged bubble, unicorn valuation, and how the next couple of years might play out. In addition, Exponent will be on hiatus for the next two months. We may have an episode or two (and will likely repost some “greatest hits”), and will be back to a weekly schedule in the fall. In this week’s episode, Ben and James briefly discuss Jony Ive’s promotion, the future of Apple, Google I/O, and Tim Cook’s speech on privacy. In this week’s episode Ben and James thank John Siracusa then dive into the EU’s antitrust investigation of Google and discuss whether or not antitrust is more or less important in technology. In this week’s episode Ben and James discuss whether or not there is a bubble, as well as a bit on the Apple Watch. Please note this was recorded before the Apple Watch reviews were released. In this week’s episode Ben and James discuss BuzzFeed in the context of the Brother Orange story, then talk about Amazon’s Dash Button and Home Services initiative, along with a dive into the technical details of Amazon’s balance sheet (sorry, it’s a bit dry) and why Ben is nervous. In this week’s episode Ben and James follow up on last week’s episode, introduce the Toilet Bowl philosophy of career development, and then dive into the future of publishers in the world of Facebook. Due to some technical issues there is a rather abrupt stop at the end – sorry about that! In this week’s episode Ben and James discuss why California is unique, diversity and inequality, James’ work on “How Will You Measure Your Life”, making decisions, and whether or not business school was worth it for us. Note: when talking about the history of cable, Ben kept saying “companies” instead of “communities.” Sorry for the confusion! We apologize for the late delivery of this podcast! Also, please note that there will no episode later this week due to Chinese New Year. This is the story of Stratechery, presented with much sheepishness on Ben’s part. How Ben thought about the market, his business model, and more. We apologize that this is a little long and perhaps a bit choppy. It’s hard to talk about us! We discuss Apple’s recent results, why analysts get Apple wrong, the fraught nature of fans, epistemic closure, and whether the iPhone can continue to grow. Note: I originally uploaded the wrong file. The correct file is 1:07 long, not 1:17. I am reposting this as many podcast clients download the file immediately. Ben and James discuss the problems with drones, how they could be used for terrorism, and how you balance upside and downside. Ben and James discuss the recent App Store controversy and how a person – or company’s – greatest strength is also their greatest weakness. Plus a special 2nd recording about the Harvard business school professor and the Chinese restaurant. Ben and James follow up on last week’s Uber discussion, talk about the problem with regulation, and worry about stagnation and the different cultures of Europe, America, and Asia. Note: A federal judge eventually gave the right for the Utah hair-braider to work. In addition, the Utah governor has pledged to look into the law affecting Zenefits, but no concrete changes have been implemented. Ben and James briefly discuss Ben’s belief in the Internet opportunity for content creators, and then dive in to the recent Uber controversy. Ben and James discuss Twitter and its strategic options, as well as YouTube’s new music service, Taylor Swift and Spotify, plus the special return of the garbage truck song. In this week’s episode Ben and James discuss Apple Pay and its impact on retailers and banks. In this week’s episode Ben and James discuss Ben’s article “Peak Google” and the future of advertising. In this week’s episode Ben and James reflect about last week’s episode and the personal feedback that resulted, then move on to discuss why Minecraft is a big deal as well as a bit about Apple’s new focus on privacy. In this week’s episode we discuss James’ first ever trip to Burning Man, ugliness in modern culture and on the Internet, the new divide in politics, and ultimately why we have hope for the future. In this week’s episode we discuss whether or not consoles will be disrupted. This episode was recorded a week ago (immediately after last week’s episode), before Ben wrote his pieces Games and Good Enough and Games and New Market Disruption. In this week’s episode we discuss how the Internet is enabling not only big winners, but also small, focused niche players, and why that’s exciting. We also discuss the impact this transition will have on society, follow up on last week’s integrated/modular discussion, and in a special “After Dark” segment briefly discuss Ben’s recent experience with Android and theorize that the Android/iOS are at equilibrium. In this episode we discuss feedback about Uber and pricing, then discuss Ben’s recent articles on Microsoft and Apple/IBM. We had some technical difficulties while recording this show, so we apologize in advance if there are any issues. Note: In the podcast Ben talks about owning a lot of Microsoft stock; to be clear that was while he was an employee. As a matter of policy he does not hold any individual stocks currently. Also! We would love it if you would rate and review this podcast on iTunes. The link is here Thank you. There’s a bit of a consensus building post WWDC: Apple has grown up, and it’s great. But is it great? Is it possible that something essential has been lost? After all, a lot of the praise being heaped on Apple and Tim Cook was once used for another company – Microsoft. In this episode we examine what it is that makes Apple unique, and why things might turn out different this time – and why they might not. In addition, we discuss the end of privacy and what might be done about it. Also! We would love it if you would rate and review this podcast on iTunes. The link is here Thanks! Are the recent debates on net neutrality, the protests of Google buses, even SOPA a sign of things to come? Building on Ben’s article The Net Neutrality Wake-up Call Ben and James discuss the intersection of technology and politics. Why do people in technology tend to dislike politics? The tech industry and creative destruction: is it good for society when companies go out of business? This episode was actually recorded on February 18; however, due to circumstances, we had to hibernate Exponent and the episode was never actually edited and posted. Now that the show is back – for good this time – we wanted to post the “missing episode” plenty of folks have asked us about. There are a couple of dated references, but the content is still very applicable. In this episode we talk about privilege and whether Silicon Valley is solving the right problems. It’s certainly not a new question, but has it become more pressing in the last few months? In this, the first episode of the Exponent podcast, we talk about our background, Microsoft and disruption, and the meaning of culture. We also explore our goals for this podcast, and just a bit about Taiwanese garbage trucks.